This book is concerned with Turkey’s political evolution, the role of Kemalism, and why a social democratic alternative has never fully developed. 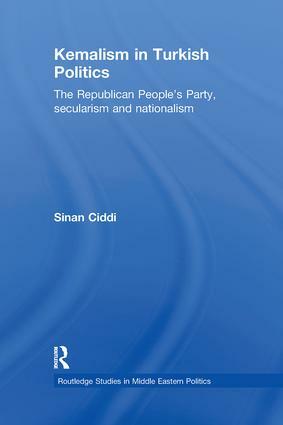 Concentrating on the electoral weaknesses of the Turkish centre-left, represented by the Republican People’s Party (CHP), Sinan Ciddi examines the roles of nationalism and the political establishment and the role of Kemalist ideology. Established by Kemal Ataturk, the CHP is seen to be the founding party of modern Turkey. Kemalism sought to create a secular and democratic society based on the principles of republicanism, populism, secularism, nationalism and revolutionism. Although this leftist ideology became an integral part of Turkish politics by the early 1960s, it has remained a comparatively weak representative movement. Its strong ideological stance advocates an authoritarian and exclusionary position, particularly in relation to matters such as multiculturalism and democratisation, fuelling many debates concerning the role of religion and nationalism within Turkey and perpetuating elements of xenophobia and intolerance. This book will be of interest to students of politics, history and current affairs, and of Turkish politics in particular. The 12 September coup d’état and its aftermath: The displacement of centre left politics? A crisis of Kemalist modernity?